I assume these clocks are as old as the buildings they’re on, and they’re arranged here in order of their appearance, based on that assumption. The first, on a building dating from 1907, and probably easy to recognise. On the Coney Street frontage of TK Maxx, on a store originally built for Boots the Chemist. It’s either about three hours slow, or it’s stopped. In the 1970s this time of 5.15 would have been significant, as it meant only 15 minutes left to get your bath salts and Aqua Manda talc from Boots. 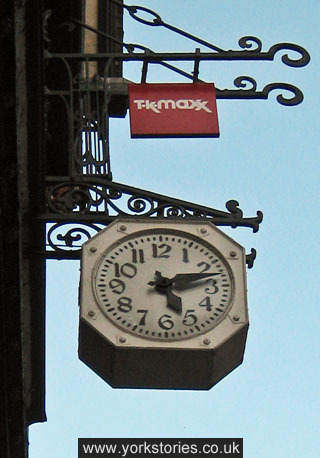 But perhaps it matters less now, as TK Maxx is open until 7pm many nights. I know, as I’m often there after 5.30, rummaging around for bargains. This frontage on Bridge Street was once the premises of Boyes. It displays not only a clock but the date of the building: 1911. A rebuilding, apparently, after a serious fire. These flat non-sticky-out clocks aren’t as helpful, particularly when they’re high up in a narrow street, as they don’t exactly grab your attention. So perhaps it doesn’t matter that this one has apparently stopped too. Still, it was put there as a useful thing, just over a century ago. We used to get the school bus from opposite here, and I’m sure the clock worked then, and helped us work out how much time we had to gossip and buy sweets before the bus came. It wasn’t functioning when I dashed past recently, but then it is opposite the Bar Convent clock, which is keeping time. More on that story later. 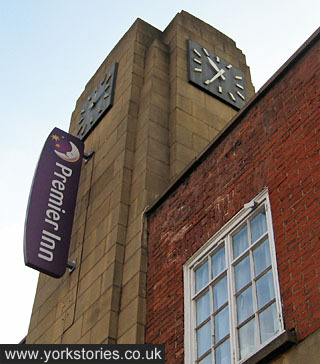 This is also a prominent clock, high up on a street corner, on the Aviva (formerly Norwich Union) offices looming over Rougier Street. A 1950s/60s build. Pictured at around 8 o’clock, reflecting the evening sun, though the clock thinks it’s about ten minutes to one. 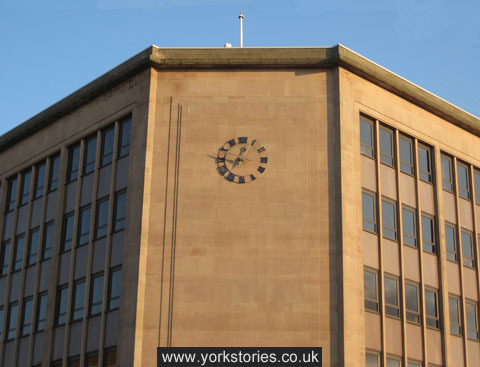 Providing a large clock hanging in the street or high up above the street was, presumably, a symbol of authority, trustworthiness, also a public-spirited approach, from Boots, Boyes, Forsselius and Norwich Union. They’re all rather handsome, and their styles different, reflecting their times. 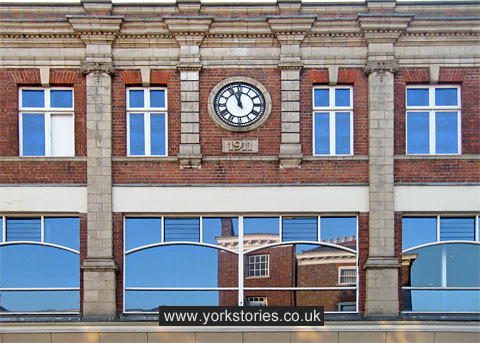 There are of course many clocks on the streets of York still reliably time-telling. More to follow.